It is thus often with a great city – hidden away, a few minutes from the busy thoroughfares, and the passing of men, is preserved a corner of peaceful quiet, which, from the contrast of its surroundings, takes on a beauty of its own. Ely Place is one of the few spots left in Dublin that has an old world solitude. It has retained the respectable dignity of its first greatness, and although the memories of the great past invest it with all that was full of life and brilliancy in the Dublin of old, there remains somehow something that is fitting in the quiet respectability of the present. 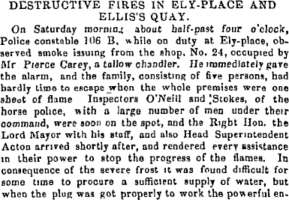 There is probably no place for its extent that comprises so many interesting incidents as the little cul-de-sac that we call Ely Place. 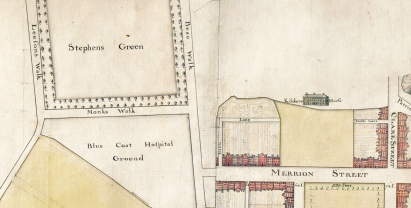 Prior to 1768 the land to the east of St Stephen’s Green had not yet been built upon. It was a parcel of ground belonging to the Blue Coat School and Hospital, which was then located in Queen Street. 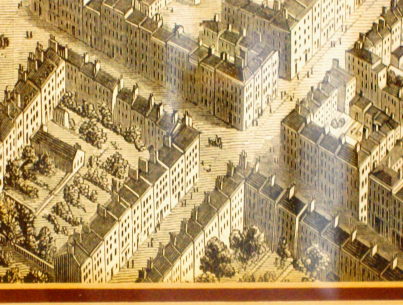 Detail, Jonathan Barker’s plan of Merrion Square, showing the site of No. 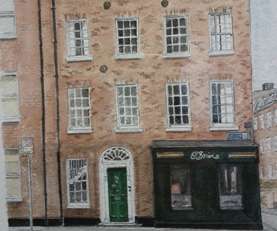 24 Ely Place (1764). 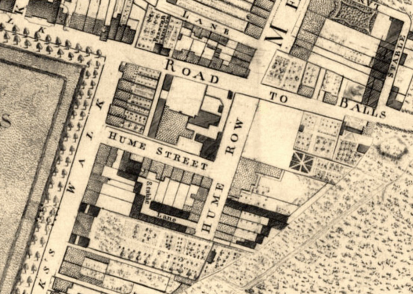 Detail of Bernard Scale’s 1773 update of Rocque’s map of Dublin showing Ely Place (still called Hume Row) and Ely House. The site of No. 24 is marked. “Curran,” said a judge to him, whose wig being a little awry, caused some laughter in court, “do you see anything ridiculous in this wig?” “Nothing but the head, my lord;” was the reply. On 7 January 1789, Thorp demised the plot to Edward Burne, a merchant of the city of Dublin. It’s likely that Burne erected what is now No. 24 Ely Place soon after, for in a lease dated 30 August 1792, he remised the new dwelling house on that same plot to a Robert Hunter, who could well have been its first resident. The first members of the legal profession to reside in No. 24 Ely Place were Charles Maturin and his brother John, a barrister and solicitor respectively, who lived here in 1835 and 1836 according to Thom’s Directory. The Maturins were descended from a Huguenot family that arrived in Ireland in the early 18th Century. 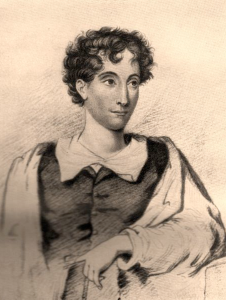 They were no doubt closely related to the gothic novelist Charles Robert Maturin (1782-1824), the author of Melmoth the Wanderer. 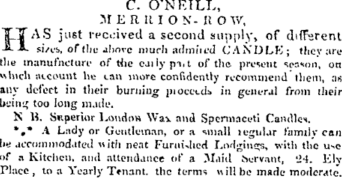 At a numerous and highly respectable Meeting of the Tallow Chandlers and Soap Boilers, held at the Corn Exchange Great Room, the following resolutions were unanimously adopted…That we view with unfeigned feelings of sorrow and regret the pauperised and degraded state of our city, once so flourishing and happy, but now, alas! presenting nothing save dilapidated houses, ruined manufactories and distressed artisans of every class…That our revered and respected fellow-citizen and representative, Daniel O’Connell, Esq., M.P., the illustrious father and liberator of his country, possesses and enjoys the full measure of our entire and unlimited confidence in the present glorious struggle he is making for the regeneration of his country. 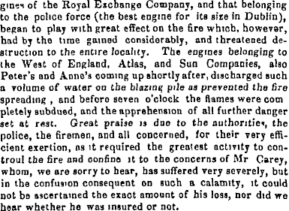 Moved by Mr. Pierce Carey; seconded by Mr. John Kane: Resolved. Pierce Carey’s wife was Alicia, daughter of Maurice Nolan. They had several children who grew up in the house, including daughters, Jane (a teacher of music), Alice, Mary Frances and Annie (a restaurant manager), and sons Moses and Edward, both commercial travellers. They had another daughter called Teresa Carey. She was a little-known artist, though she did display her work at the Irish Exhibition of Arts and Manufactures in Dublin in 1882. A catalogue from the event shows that her painting, The Village Blacksmith, sold for £20, quite a sum in the late Victorian period. The 1901 Census return for 24 Ely Place showing the Carey family. Pierce Carey died sometime in the late 19th Century, for his wife Alicia is noted as a widow in the 1901 census. She died in No. 24 on 18 May 1913. Members of the Carey family remained in the house until the 1940s. Teresa Carey, the painter, was the last surviving daughter. She died in St Michael’s Hospital, Dun Laoghaire on 7 September 1943. Other agencies that were based in No. 24 Ely Place in the 1970s and 80s included Michael O’Reilly Associates Public Relations, The Irish Marketing Surveys, The Speedwriting Institute, Irish Consumer Research, The Microcomputer Unit.